4. resetting a monster.meaning you get a 3000 attack barbaros even if you normal summon it,making it 1900 attack,flipping it by after book of moon will give you a 3000 attack barbaros. 5. stop monster's from activating subsequent effect after the turn player uses his priority,best example DAD. escape under the LOOPHOLE of skill drain!!! 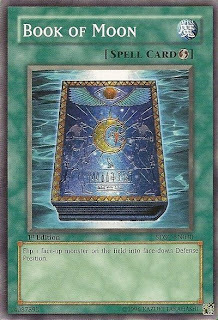 yes...this card allows your monster to have their trigger effect activated even if skill drain is active on the field,why?because as i had mention in the earlier post,skill drain does not negate the activation of monster effects,and in order for it to negate their effect,monster had to be FACE UP on the field when it's effect resolves.dreading to get rid of that skill drain?no problem...contact yout GB for gyzarus then book of moon it,and pop!no more skill drain!